Here is a really quick card that I made today with this darling image from the July 2011 KOTM from Unity. I colored the image in with my Copic markers and added it to this card with scraps of patterned paper that I sewed onto it. When I say quick.....I mean really quick compared to the time it takes me to make most cards.....this one was under 30 minutes. Here is a close up of that super cute image. I added a few pen accents after I colored it with the Copics and the fun XO sentiment from SRM Stickers. I am linking this up to the Unity Kit of the Month Sketch Challenge. I am also linking this up to the Friends With Flair Unity blog hop post. Thanks for stopping by!! Don't forget that I have a fun giveaway going on HERE. Very cute and a great take on the KOM Sketch. I too love this sweet image. Amy, this card is adorable!! Love the bees, they are so cute!! Great take on the sketch. Completely ADORABLE!!! Really LOVE how this came out! 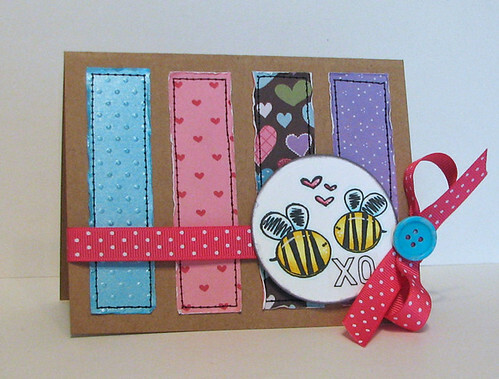 What an adorable card, love the sewing! I LOVE those bees! I have that stamp, but haven't use it yet....you have inspired me. Very cute! 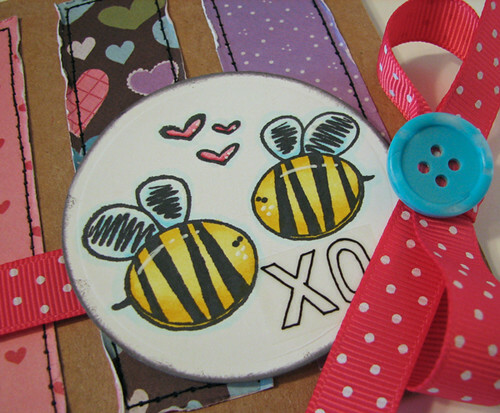 Love those bees and I love the background papers you used - the sewing adds such nice detail and finish! Wow! You make beautiful cards! Love everything I've seen so far! This is so CUTE! I love the stitching and the adorable stamp! This is soooo incredibly adorable!!! Whimsical and fun...this is sure to be a hit with anyone who receives it! great card! love those bee's, they are some of my faves! I just featured the Unity FB page.